Preheat the oven to 200ºC, fan 180ºC, gas 6. Put the wedges on a large baking tray in a single layer and cook for 20 minutes. Meanwhile, put the onion, garlic, vinegar, tomatoes and sugar in a pan and bring to the boil.Turn the heat down to low and simmer for 10 minutes, stirring frequently. Line a baking tray with foil. Brush the fish fillets with the oil, season with plenty of freshly ground black pepper and arrange on the tray. Put in the oven with the wedges for the final 10 minutes of cooking time. Put the kale in a microwave-proof bowl with 2 tablespoons water, cover loosely with cling film and cook on high for 1 minute 30 seconds. 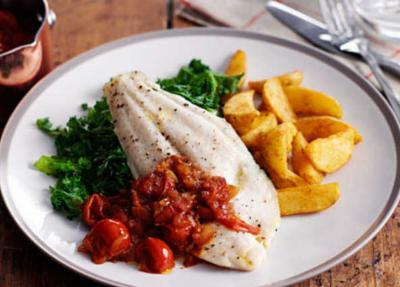 Serve with the fish, wedges and cherry tomato sauce.